A consumer complained to a local cheesemaker that they had found a large chunk of something hard in their cheese. The cheesemaker sent the sample to Forensic Analytical Laboratories for analysis, concerned that the chunk may be glass or something else harmful. The sample was initially examined using low magnification microscopy and was quite large, about 8mm in length (1/3 of an inch). 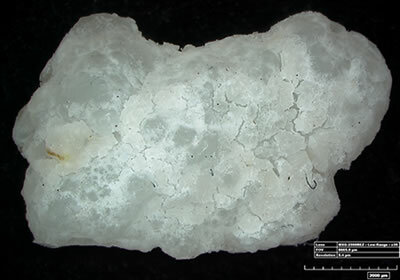 It was then analyzed by FTIR and determined to be composed of calcium lactate, the most common component of "cheese crystals," the crunchy crystals sometimes encountered in hard cheeses. Further analysis of the sample by Raman microscopy revealed the presence of tyrosine, an amino acid also encountered in cheese crystals. The combination of instrumentation had produced a definitive result. The cheesemaker was delighted to hear that the sample was a normal, though large, cheese crystal and absolutely harmless. The sanitation and disinfection of store shopping carts is typically performed using disinfecting wipes that customers use to wipe down the most commonly touched areas of the carts (e.g. handles, child seating area). This method of disinfection is insufficient unless used for extended periods of time, which in the majority of cases is not performed. FALI was approached to test the efficacy of UV technology to disinfect shopping carts. Discs were inoculated with bacterial species, positioned on shopping carts, and exposed to UV light for a short period of time. The discs were then removed and incubated to determine the efficacy of the UV light on decreasing the amount of viable bacteria. The results showed a significant decrease in the amount of bacterial growth on the discs exposed to the UV light. Methicillin-resistant Staphylococcus aureus (MRSA) is a significant concern in the health care industry. MRSA is any strain of Staphylococcus aureus that has evolved to become resistant to a number of commonly prescribed antibiotics. In the dental industry plastic has a number of functions and concern arose on the ability of MRSA to colonize and grow on the plastic. FALI was approached to determine whether (MRSA) will survive and grow on the surface of plastic used in the dental industry. MRSA was inoculated onto plastic samples obtained from a dental supply company and incubated. 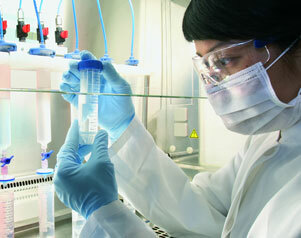 The plastic samples were then tested over time for their ability to support the growth of MRSA. The results showed that with time the amount of recoverable bacteria from the dental plastic decreased, indicating that dental plastic does not support the growth of MRSA. Commercially available powdered bacteria blends are available to control algal growth in various water systems, including systems containing recycled water. There was a concern that recycled water contains chemicals that may inhibit the growth of the bacteria. FALI was approached to compare the ability of the bacteria in commercial blends to grow in pond water with the ability of those bacteria to grow in recycled water. Bacterial growth was tested under both aerobic and anaerobic conditions. The results showed that there was no significant difference in bacterial growth between the pond water and recycled water in either aerobic or anaerobic conditions. A semiconductor production line was experiencing >90% reduction in life time between rebuilds of integral turbomolecular pumps. The normal life of 20,000 hrs had dropped to 1000-1800 hrs. A number of these $10k pumps were meant to be on-hand for exchanging with failed pumps, but the operator was finding that most pumps were always away being rebuilt and few were available for exchanging. This was holding up the production line with greater frequency. An unknown residue was found in the turbo pumps, when they were being rebuilt after failure. FALI analyzed the residue by SEM/EDS and found it to consist primarily of aluminum and chlorine. The process gas contained chlorine, which is known to be corrosive to aluminum parts in the system. The Al-Cl composition of the residue not only pointed the investigation toward aluminum components of the system, but also eliminated areas with no exposed aluminum. Aluminum components are meant to be isolated from the process gas using various seals and o-rings. It was found that the maintenance procedure for an aluminum component did not call for inspecting or greasing an o-ring often enough, and the corrosive process gas was getting past that location and attacking aluminum parts downstream. The aluminum corrosion product then worked its way through the system, accumulating in the turbo pumps until they failed. Improved attention to maintenance of this o-ring has returned the lifetime of the turbo pumps and production line reliability to their normal levels . The lab work was instrumental in locating the source of the residue and getting the line back to normal production levels. As an aside, the operator informed the pump manufacturer of this issue, and they are informing other owners of the solution to this problem. Our client was also very appreciative that we completed the lab work extremely quickly (24 hrs), so they could address the problem quickly.